Russian cuisine has diversified over the years, with a lot of the menu items you’ll find on fast food menus and in restaurants that are marketed as being Russian actually originating from parts of the former Soviet Union. To be fair, the reputation of Russian food has never really been impressive across the world, but recently things have started to get a bit better, with more influence from overseas seeping into the previously very insular restaurant culture of the former Soviet Union. Since the fall of communism and the introduction of more western influence, the menu has taken shape and instead of the frugal recipes that most people imagine to be the staple Russian diet, International cuisine has exploded onto the high street and into the fast food chains. Multinational fast food monsters such as Burger King, now have a presence in Moscow. 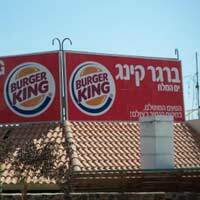 The very first Burger king was opened in the Metropolis shopping mall in northwest of Moscow, swiftly followed by another restaurant in the Evropeiskyi shopping centre on the west side of Moscow. A third is already planned for the Mega Teplyi Stan shopping mall along with others when the time is right. There are plenty of Golden Arches to be found in Moscow, around 70 at the last count, and the very first McDonalds opened to much fanfare in the city in January1990 – at the time it was the largest McDonalds in the world. Fast food is gaining in popularity in Russia and you’ll easily be able to find a McDonald's in pretty much any shopping mall. Another cheap option is fast food, a growing trend in Moscow. The likes of McDonald's and Rostiks are seen near almost every shopping mall. Sbarros Pizzas are a good, filling fast food option if you’re visiting the city and fancy a junk food fix, but beware, some of the fast food retailers in the city aren’t well known for being generous with their portion sizes. Local fast food chain offerings probably won’t be enough for UK consumers used to supersizing, and it can be expensive to order some dishes that would traditionally be cheap in the UK – such as a baked potato. You’ll probably get charged for sauces and ketchup too. If fried chicken is your passion, the Russian KFC equivalent is called Rostiks. If it’s authentic Russian-style fast food that excites your taste buds, you’re catered for with chains that serve up traditional Russian dishes, such as Teremok Russkie Bliny and Kroshka Kartoshka. These chains aren’t as popular in Russia as the global pizza and burger joints though. The first Teremok opened in Moscow back in 1998 selling crèpes from a street kiosk. The chain has expanded into food courts in shopping malls and airports, and a chain of restaurants. You can find Teremoks in St Petersburg and Russia, and there are around 70 outlets to choose from. Kroshka Kartoshka sell baked potatoes or ‘kartoshka’ with a selection of fillings, some of which you probably wouldn’t see on the streets of the UK, like bacon and sour cream, aubergine stew, or feta cheese. The chain also offers salads and sandwiches – and beer. There are over 180 outlets in Russia, and even a 24 hour restaurant in Moscow if you need a baked potato fix in the early hours.